The 2015 Chevrolet Silverado Midnight Edition is the type of pickup truck that Batman would drive to patrol the underworld of Gotham City. The menacing profile, all-black front end with body-colored grille, bumper, headlamp bezels, tow hooks and fog lamps; black side moldings and beltline moldings; and 18-inch black painted alloy wheels with Goodyear Wrangler Duratrac all-terrain tires is enough to strike fear in hearts of the Dark Knight’s foes. But you don’t have to be a superhero to drive the new 2015 Silverado special edition. Starting in February, you can order one of the 5,000 units that will be produced for the 2015 model year. Like all 2015 Silverado 1500 Z71s, the Midnight special editions include off-road suspension, a locking rear differential, Hill Descent Control and a trailering package. The Silverado Midnight editions also include rear park assist and heated, power-adjusted outside rear-view mirrors. The exterior look is finished off with special Z71 badges on the doors, a spray-in bedliner (black, of course), and black Chevrolet bowties front and rear. Chevrolet will offer the Silverado Midnight edition in either 1500 double-cab or crew-cab models. Package prices will be $1,595 to $1,995, depending on the model. 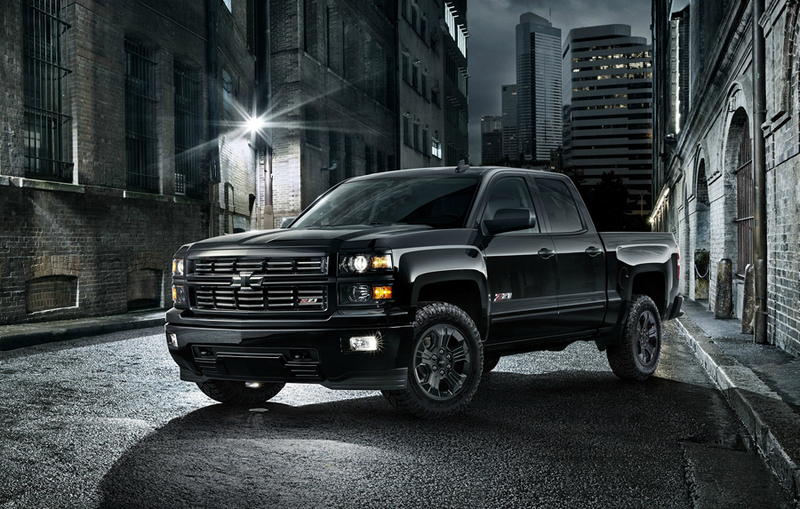 The 2015 Chevrolet Silverado midnight Edition will make it’s public debut on February 14 at the Chicago Auto Show.